It only takes one person to dig a post with the LLittle Beaver Gas One Man Post Hole Digger Earth Drill Auger! 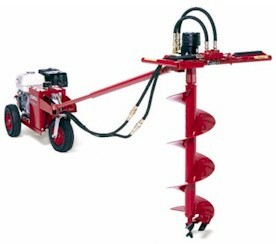 Lightweight, powerful and reliable, the high speed auger rotation digs holes quickly and cleanly. Torque-free digging eliminates kickback. For over 40 years, the versatile Little Beaver mechanical earth drill has been the #1 choice of rental store owners, fencing contractors, and other professionals who require a one-man auger that is safe and simple to operate. Thanks to their patented torque tube, theyâve eliminated the kickback found in competitive augers, making one-man drilling safe and productive. They build their own heavy-duty transmissions that feature cooling fins for quick heat dissipation, o-ring seals, and heat treated shafts and bearings mounted in an oil bath. The engine throttle control and the on/off switch are conveniently located on the left handle. Padded handles are ergonomically designed for less fatiguing operation. A reliable, centrifugal clutch slips when a buried object is encountered or the auger is overloaded. This protects the flexible drive cable and the transmission gears and shafts from damage. Little Beaver earth drills are incredibly fast. Operating at 360 RPMs, these augers rotate much faster than competitive units. Not only does this increase your drilling productivity, but it also results in cleaner holes. The Little Beaver mechanical earth drill gets into areas inaccessible to skid-steer loaders. When traveling over manicured turf areas, the easy rolling wheeled carriage leaves no marks, eliminating costly turf restoration costs.